There is a limited quantity (1) of this item available. It is delivered based on who orders and pays first. 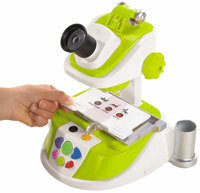 Experience the microscopic world in an exciting new way with the iTikes Microscope, designed for kids ages four and up. Get close to the up to 5 included specimen slides and learn fun facts about bugs, plants, and animals. 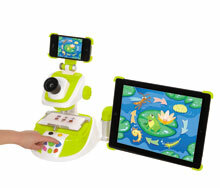 The microscope also connects to select Apple devices for access to exclusive interactive images and games. 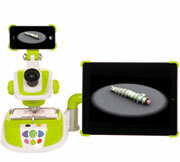 Kids can zoom into the microscopic world with this real, lens-based microscope, featuring 100x, 200x, and 300x magnification. This easy-to-use, kid-friendly device includes 12 slides, each containing three real plant, insect, or animal specimens. Clip a slide into the microscope's stage and turn the adjustment knob to get an intimate view of the specimen. With the iTikes Microscope, kids can have fun viewing the details of a specimen while improving their knowledge of natural science. The microscope's built-in learning system reads aloud interesting facts and information, so kids can learn while they're exploring the tiny world beneath the lens. The iTikes Microscope is a stand-alone device, but additional features can be unlocked with a free app. Simply connect your iPad, iPhone, or iPod touch to the microscope to download the app. You'll have access to high-definition images, videos, animations, and games that provide even more information about the included slides. Kids can zoom, rotate, and animate 3D images using touch gestures like tapping and "pinching" on your Apple device's touch screen. A single unit of this item is a Microscope. You can buy 1 Microscope or add 1 Microscope to your shopping cart with the buttons below. But assuming you need to order more than 1 Microscope, just enter the value in the quantity box below and then click either Buy to head to checkout, or click on Cart icon to add it to your shopping cart. Make Money You can make ₦500.00 per unit sold when someone you refer buys this item. Login or create an account, then come back here to get the code/links.